This year’s winner of the Overall Performance Art Award at the Smirnoff Winter Pride Awards –KIMATICA are proud to announce their latest hi-tech, interactive projection- mapping show “The Winter Spirit”. This epic new live show is an exciting collaboration with the front-woman of electronic dream-rock band Lunar & the Deception. This enchanting new 10 minute act is perfect for high end Winter or Snow themed events. We are offering this performance to your agency (and your clients) for those who are looking to add that extra special contemporary and cutting edge touch to their entertainment programme. Kimatica’s award winning performances are guaranteed unique, multi-sensory experiences. Visual combinations of cutting-edge body mapping technology, mythological characters in extravagant theatrical costumes, all centred around the apex of dance and now for the first time, combined with Lunar & the Deceptions original score and hauntingly beautiful, live vocal performance. A powerful, immersive and hypnotic ten minute show, created with the use of unique custom software by Kimatica, where the body’s physical movements interact directly with the visuals. This offers a magical escape which will mesmerise audiences and, without doubt, give them an experience they will never forget. 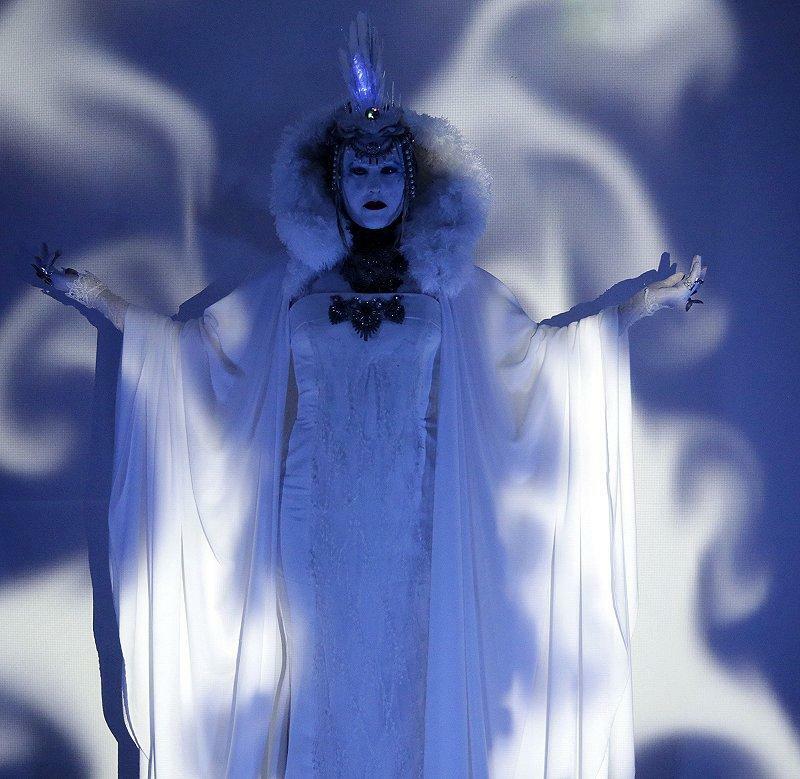 The shows narrative begins with the Snow Queen lost in a wintery forest, the story centres on the struggle between good and evil through the ‘broken mirror ’ mythology. The narrative encourages viewers to step outside of their consciousness. Love, vanity, sorcery, enlightenment and eternity are all themes that are prevalent through the abstract interactive visuals, giving an ancient fairy-tale a new evocative, modern twist. Kimatica shows have toured internationally over the last two years, attracting the attention of the media, creative industries and interdisciplinary art community. They are the first performance artists to be represented by the Kinetica Museum and supported by the Barbican Centre. They have performed at festivals including Glastonbury, Roskilde Festival and the Edinburgh Fringe, as well as in very selective private events in the UK such as HomeHouse, Shoreditch House, The Box, Cirque de Soir and District Club. They have also created bespoke shows for high-end music and creative agencies such as MTV, Uvluva Vodka, Smirnoff and Golin Harris Agency. The show lasts for approximately 10 – 12 minutes. Team: 1x Producer & director, 1 x tech director & VJ, 1 x sound tech & tech set up assistant, 1 x singer, 1 x dancer, 1 x makeup artist & stylist, 1 x set designer & assistant. Equipment: Projection screen, 5000 lumens Projector, 3D cameras, Non reflective, non- slippery floor, Computer, Mic, LED lights panels, Cabling Projector stand. The venue has to provide a fairly powerful PA to play the music. Is very important that they get in touch with the tech people of the venue, to figure out where they will be setting up the projector, and also the stage dimensions and position. Everything they create is bespoke and unique for the show and venue.